Have you ever ventured up to the Hawk’s Nest and just listened to some of the conversations around you? Perhaps it’s not always my intention to eavesdrop, but sometimes, especially when a person is upset or excited about something, I get more than an earful of complaining, whining, or reveling. It’s obvious students have comments to share, both good and bad, but maybe they don’t really know how to let their voice be heard. One avenue is to talk with Student Life representatives. They can be found keeping office hours in the Student Life office next to the Hawk’s Nest throughout the week. But if you don’t want such a formal setting to speak your mind, “Tell it to the Chief”! This new column in The Chieftain is a place where students can speak their mind about anything – anonymously – your name will be kept out. So…. Speak your mind by October 4th to be heard in the next issue of the Chieftain! Email to Chieftain@BHC.edu. Remember, you name will be kept out of your comments or complaints. If you don’t care whether your identity is known, share on the Facebook or Twitter accounts. You can also stop down at the Chieftain office, building 4, room 116, and tell us in person or write it down and place it in the comments box outside the office door. How many times did you get lost on campus your first week? 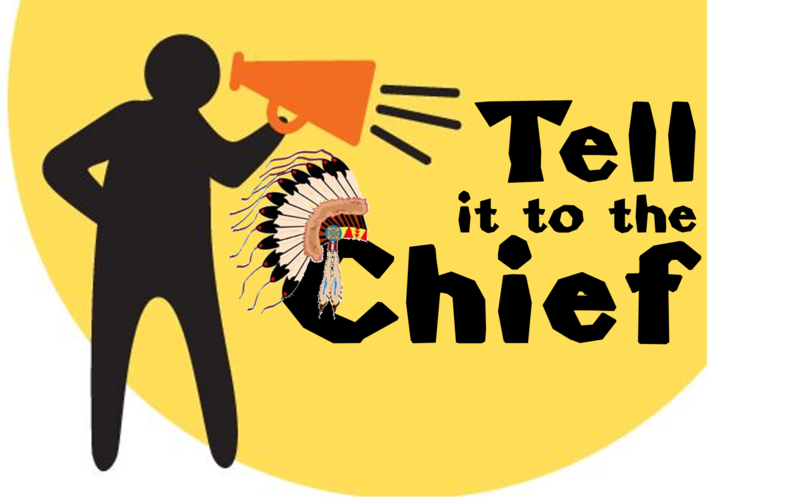 Tell it to the Chief! Frustrated about food options on campus? Or is Subway your favorite restaurant? Tell it to the Chief! Are you tired of parking in a foreign land? Or do you enjoy the long walk? Tell it to the Chief! Did you have a really good advisor who directed you in just the right path? Or not? Tell it to the Chief! Maybe you found a particularly helpful person in the Financial Aid office…. Tell it to the Chief! What are your thoughts about the Hawk’s Hub Book-buy-back program? Tell it to the Chief! How about enrollment? It wasn’t that long ago… was the procedure easy or difficult? Tell it to the Chief! Previous Previous post: Baby hearts, livers, and lungs – oh, my!